French filmmaker Mathias Frantz and his crew had spent weeks searching the wilder crannies of New York for the quintessence of nature in the city—material that will be used in the first of four profiles of wildlife in major international cities they are calling “Naturopolis.” The week before I’d accompanied them on a boat on the East River where we angled for striped bass in the riptides of Hell Gate and snuck up on a colony of nesting cormorants on U-Thant Island, situated below the cliff-like UN building that towered as a backdrop. One week later we met at River Park, a pocket of greenery in the West Farms section of the South Bronx that is named after Gotham’s only true freshwater river, the Bronx River. The Bronx River is an urban flowage that is becoming restored mainly through the efforts of the New York City Department of Parks and the Bronx River Alliance of non-profits. River Park sits just below the lowermost dam on the river, one that prevents typical migratory fish such as alewife from ascending farther upstream to spawn. The river is also home to the American eel, a species that was described in the subtitle of a recent book as the “most mysterious fish in the sea.” And mysterious they are, baby eels, having migrated all the way from the middle of the Atlantic Ocean are slowed down, but not always stopped from passing dams. 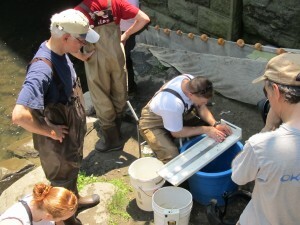 Our crew of agency and academic biologists and volunteers planned on first electrofishing below the dam and then above it to obtain a sense of the relative abundances of eels on both sides of this barrier. Our colleague Chris Bowser of the New York State Department of Environmental Conservation wore the backpack electroshocking unit on the first pass. Probing around the rocky shallows with the device’s electrical hoop turned up plenty of eels, together with sunfish, darter fish, and crayfish that were all momentarily stunned while two eager netters tried to gather them before they revived. On the second pass, my Ph.D. student George Jackman operated the shocker. George has an unusual background for a doctoral student—he is a retired New York City police lieutenant. As such, he sees things that mere civilians miss. As George stepped deeper into the flow to begin “fishing” he eyed a plastic device and reached down and then held up a metal sleeve—the magazine from a handgun. Our crew and the observers who gathered were amazed, making comments about this truly being urban nature. But a minute later the incident became considerably enhanced: George yelled “wow” as he spotted the actual handgun—and then retrieved and held up a10 mm Glock. The assemblage couldn’t quite believe this, and neither could the French filmmakers who asked whether we’d planted it there for Naturopolis. We hadn’t, of course, but I wondered whether the eventual viewers of Naturopolis would believe that such an iconic urban symbol would have been discovered by accident. The gun’s being found there makes sense, it was located just below the 180th Street Bridge—a perfect place to stop a car and toss a gun into the water. I questioned if its owner threw the gun into the river when it was raging with high water, not knowing that the Bronx River is a “spate” flow that floods quickly when it rains and then drops to low levels, shallow enough to reveal a handgun. George later gave the weapon to a patrolman, who guessed it was used in a murder and promised to do ballistics tests. The tests showed that the gun was used in a shooting not far from there about a week earlier, and at a time when the river was so high we needed to cancel our fieldwork. This gun had been fired 10 times into the back of its victim. Remarkably, the man survived, this gun is so powerful that it essentially perforated his torso while apparently missing vital organs. The remainder of the day was less eventful, with many eels surveyed below the dam and only about one-fourth as many above, showing that eels can indeed somehow work their way past the dam. The eel “ladder” we plan to install next year should ease their access to the river’s headwaters as they follow their natural instincts and swim, obliviously, maybe even mysteriously, past whatever unnatural jetsam society leaves along its bottom. Note: This piece was originally published on the Fordham University Press blog, Fordham Impressions. Underwater New York is republishing it here with permission from the author. John Waldman has studied and explored New York Harbor for much of his career, first with the Hudson River Foundation for Science and Environmental Research and then as Professor of Biology at Queens College. In autumn 2012 Fordham Press will publish two of Waldman’s books on nature in New York City, a revision of Heartbeats in the Muck: The History, Sea Life, and Environment of New York Harbor and Still the Same Hawk: Reflections on Nature in New York, an anthology of new creative non-fiction by celebrated New York authors.